Whether you are going away on a big family trip or enjoying a ‘staycation’ at home, there are two words that every parent and guardian dreads hearing this school holidays: “I’M BORED!” Keeping kids entertained without hitting the hip pocket too hard is always a challenge for families over the holidays, but Hinkler is here to help with some good old-fashioned family fun! In fact, for the purposes of this blog, we’ve renamed ‘bored kids’ as ‘holiday funsters’! After all, who can be bored when they’re a ‘holiday funster’? We have compiled this short list of suggested activities to get your holiday funsters started on a summer holiday filled with good times. Each activity – mostly using everyday household items from around the home – encourages independence, self-confidence and creativity. Holiday Jigsaw: Work together with your kids to construct a jigsaw or two out of your favourite holiday snaps (simply take a large A4 to A3 printout of a photo, glue it to a cardboard backing, and cut it into shape – the number of pieces will determine the level of difficulty). Then, mix up the pieces and work together to assemble the jigsaw. Memory: Collect an assortment of up to 20 small items, place them on a tray, and cover them up with a cloth. Have your child write down as many items as they can. It’s even more fun if you use an egg timer and try to ‘beat the clock’! “I went on holiday and I saw”: The perfect game for a road trip! Have each person say “I went on holiday and I saw …” Then, each person continues to add a new place name or thing to the list, repeating all the place names and things that other game players have said. This game can go for as long as your memory can stand! Hopscotch: Everyone knows hopscotch! The thing is to remember how much fun it is to play! All you need is a piece of chalk and a stone to throw. Mix it up by varying the pattern of your hopscotch grid – draw a snake, a rocket, a robot or, for those who are really hop-happy, a very long train! Egg and Spoon Race: Take an egg, put it on a spoon … now run! If there aren’t enough kids to race, encourage your holiday funsters to create an egg and spoon obstacle course and time themselves. Rope Wranglers: One long piece of rope = unlimited fun! Have your holiday funsters do the following: walk on the rope, jump over the rope, use it in a game of ‘limbo’, skip with the rope and play ‘tug of war’. Passionfruit Bliss Balls: Combine ¾ cup of oats, ¼ cup of desiccated coconut, 6 pitted dates and the contents of 2 passionfruit in a food processor. Then, roll the mixture into small balls (the size of each bliss ball should be somewhere between a large marble and a ping pong ball). Store in the fridge (if they last that long!). Fro Yo Fun: Do your holiday funsters love going to frozen yoghurt bars? Create your own ‘fro yo’ bar at home – you could use ordinary yoghurt or frozen yoghurt available from most supermarkets. Simply group together around 12 tiny bowls of toppings – choose an assortment lollies, cubes of fresh fruit, cookie pieces, chocolate, crumbled cake, tinned fruit, ice cream toppings, even jam – and let everyone fill their own bowl! 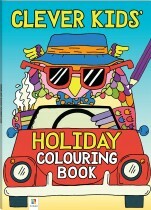 Also be sure to check out Hinkler’s fantastic range of colouring and activity books. These are a highly mobile way to keep kids mindfully occupied in airports, on road trips and on those mercury-soaring days when it is too hot to venture outside for too long. 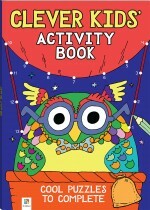 Colour and activity books help kids to focus and decompress from too much stimulation (hello holiday snack food! ), and act as an excellent lo-fi ‘time out’ from screens and gaming consoles! 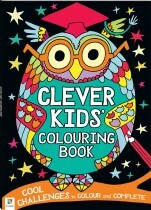 With the ‘Clever Kids’ range, children aged 6-12 can put their skills to the test with 32 pages of activities.Then, after they have completed each challenge, they can go wild and colour the scenes any way they like! 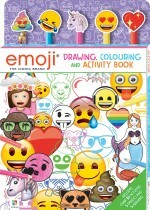 And, for all the Emoji fans out there, let the good times LOL with Hinkler’s EPIC Drawing, Colouring and Activity Book set! Starring everyone’s favourite emojis, this set contains brain-bending emoji-tastic puzzles to solve, including emoji sudoku, emoji spot-the-difference, emoji copy-the-picture, emoji complete-the-sequence and more! Then, when kids are all puzzled out, they can relax and colour in with the five super-cute emoji pencils and play with the cool eraser toppers! 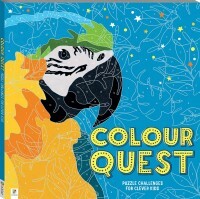 For any puzzle masters in your midst, set the bar high with Color Quest, where they follow the colour codes to uncover the amazing picture hidden in the 64-page book. 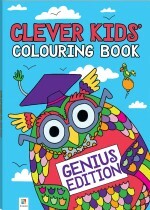 Then, they can put their colouring skills to the test and get ready for the ultimate puzzle challenge with trivia to help them puzzle their way through the colour quest. We hope this list of Hinkler’s School Holiday Boredom Busters helps your family over the long summer holidays. Best of all, if your holiday funsters are inspired by this list to create their own holiday fun (after all, that’s the end game! ), we’ll consider our job DONE! Written by Samone | Samone is a freelance editor for Hinkler Books. When she's not writing or editing, she can be found dancing to her favourite 80s playlists or walking her retired racing greyhound, Diesel (really, really fast).